Are you looking for a natural method to treat erectile dysfunction, low libido, and sexual anxiety? Are you uncertain about taking Viagra due to its side effects? If so, this article is for you. I would like to introduce you to Mother Nature’s Viagra – one of the most incredible superfoods on the planet. 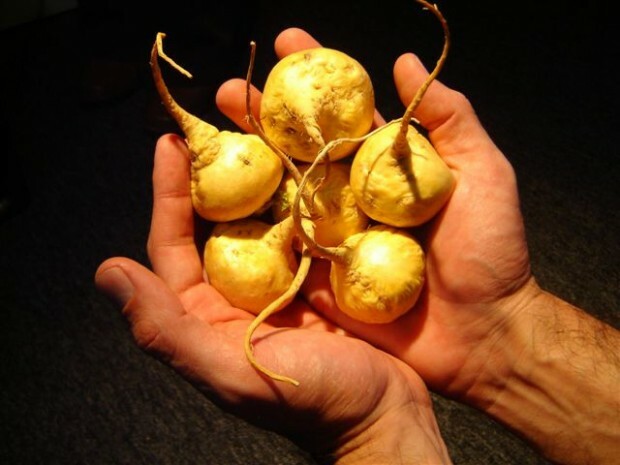 Maca is a root vegetable that looks a little bit like a radish. It is loaded with vitamins, minerals, phytonutrients, and amino acids. Besides providing an incredible amount of energy, strength, and endurance, you can count on this Peruvian nutritional gem to give you more fulfilling orgasms, and to enhance your sexual performance with your partner. Lepidium meyenii, better known as Maca, has been used for thousands of years and is one of the highest altitude foods found in the world. Why do you think Mother Nature decided to cultivate this sexual pleasure treasure 14,000 feet high? Could it be because she feared men might overuse Maca if it was available in their backyard? All joking aside, Maca is a powerful male sexual enhancer that can significantly improve intimate encounters. It’s natural, free of side-effects, and in my opinion, every man should add one teaspoon of this potent powder to their morning smoothie. If smoothies don’t do it for you, may I interest you in some decadent Maca chocolate? The recommended daily dose of Maca ranges from 500mg – 4000mg. It is a good idea to ask your Naturopathic Doctor for appropriate dosing. The right dosage is important; otherwise you might not see a significant change in your sexual health. It is also imperative to take Maca on a cycle. My recommendation is to take one week off every month. The good news is that you won’t be roasting this root vegetable in your oven like the Peruvians do. It is available in North America in powder or capsule form, which makes life a bit easier for men who don’t like to cook. Maca may even indirectly help you find the right partner if you’re single. Doesn’t it make sense that a boost in libido and sexual desire might encourage single men to seek companionship? Think about it – with low energy, depressed mood, and low libido – it’s no surprise that sitting on the couch and watching movies alone is more appealing than going out and socializing with other singles. If this sounds all too familiar, trust me, Maca may be just what you need. Start putting yourself out there and go get yourself a date for this weekend. With one phone call, you can make reservations at a nice romantic restaurant for the two of you. And in case you are still unsure about the value of Mother Nature’s Viagra, you should know that during Spanish colonization, Maca was used as currency and carried greater value than gold. Thank goodness you’ll be able to enjoy your date without a large radish stuffed in your pocket.